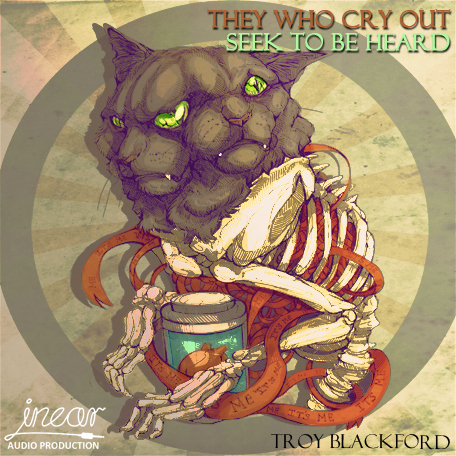 Our first ever audiobook, They Who Cry Out Seek to be Heard by Troy Blackford, was well received with positive reviews from its many listeners. Featuring the acting talent of Katy Jane and Charlie Elliott it contained eight short horror stories ranging from talking household appliances to a job interview that terrifies is more than one way. About a month ago we were approached by our Sound Engineer who explained that after working with us on all of our audiobooks he had refined his workflow and wanted to go back and re-visit They Who Cry Out Seek to be Heard to make it even better. We couldn’t say no. To go along with this remastering, we asked talented horror artist Michelle Harvey to listen to the audiobook and come up with some art based on it. And she didn’t disappoint. We could be convinced to sell art prints of this design if you are interested? Let us know. To wrap up this package of remastered audio and a new cover image we have also created a MP4 for the audiobook. This file – which can be read by most audio programs – contains chapter listings allowing you to jump to any story in the audiobook you like. It will also remember your position when you stop listening meaning you can carry on listening to a story from right where you left off. The MP3 version is still available to download – if you’d rather have that. If you haven’t bought They Who Cry Out Seek to be Heard yet, simply head over to the shop and buy it. You can choose what currency to pay in (GB Pounds, US Dollars or Euro) from the drop down on the product page. Once your payment has been processed by PayPal (who accept all credit and debit cards, you don’t need to have a PayPal account) which happens almost instantly, you’ll be sent a email containing links to the files. If you have already bought the audiobook, just log in to your account on our site and you’ll be able to download it again. If you happen to have bought it as a ‘guest’ and don’t have a log in, just get in touch with your name and we’ll set you up with an account you can use.